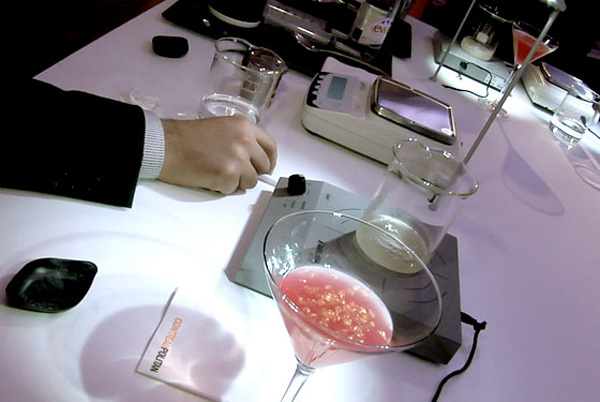 Molecular Gastronomy is one of those things that mixes design, science, and food/drinks so nicely, i’ve been fascinated with the concept for ages… and as i learned more, Molecular Mixology has become even more of a fascination! So when i got a press release about Xavier Herit’s new take on the Cointreau Pearls, it launched me off on a research mission across the web, finding out more about the creation of Cointreau Pearls across the world, the special kit they produced just for bartenders, videos of it in action, and lots more images on the next page to catch you up on my finds! 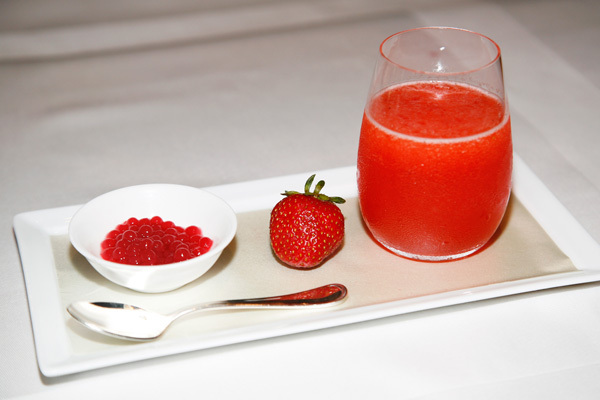 Above you are seeing a close up of Xavier’s Cointreau Pearls in which he infused strawberry, and he serves them alongside Margaritas, and also floating in glasses of champagne. P.S. Now, if only i could get Cointreau to teach me how to do it! It’s so tempting to start up a crazy lab/bar and start experimenting with all of these new techniques… perhaps a future project for the newly named NOTLabs? Taking inspiration from the work of Adrià Ferran, the legendary chef of the famous restaurant El Bulli and a master of molecular gastronomy, the research teams at Cointreau, always at the cutting edge of innovation in the bartending world, sought to develop a simple technical process for turning Cointreau into solid spheres. 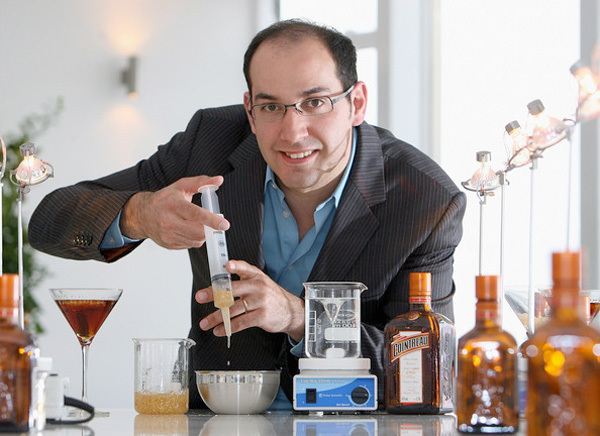 In order to do so, they contacted Fernando Castellon, an expert mixologist renowned among bartending professionals. 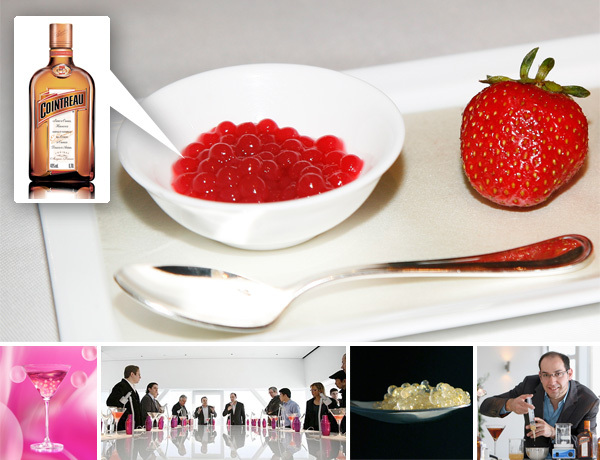 After several months of research and hundreds of trials to fine-tune the best formula for turning Cointreau from a liquid to a solid state, Cointreau’s team managed to obtain perfect, delightfully iridescent pearls of Cointreau which burst into life in one’s mouth in a symphony of delicious flavours. 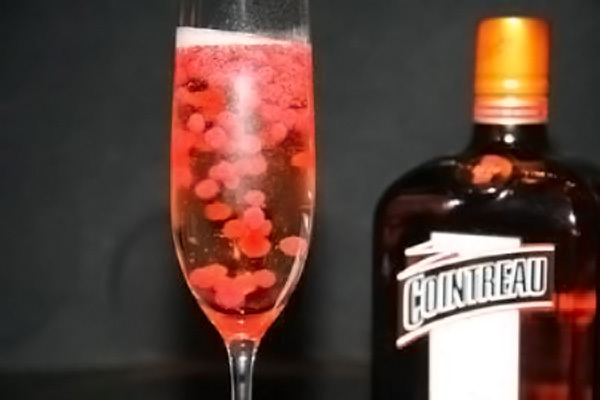 Named “Cointreau caviar”, the new product, which was first launched in Paris where it was presented to the greatest bartenders, took New York by storm, delighting the best barmen there. The next stop was London, Europe’s cocktail capital. 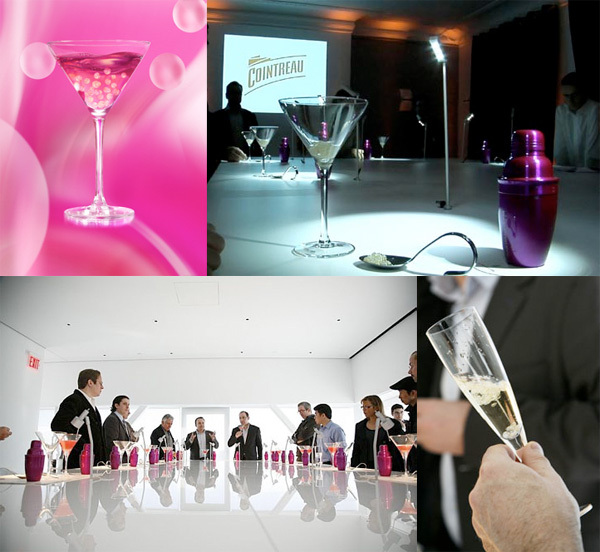 This whole post which has me exploring Cointreau Pearls all over the web started from an email i received with the following two pics from the introduction of these pearls to NY in feb 08. Inside a shaker top, muddle two strawberries, brown sugar, and fresh lime juice together. Add the Cointreau and the tequila. Shake all the ingredients together with ice and strain into a Riedel malt glass. Place Cointreau & Strawberry pearls in a small china cup. Serve with a spoon. Pearls should be enjoyed as a gustative experience while drinking the cocktail. NYMag also has a piece on the introduction of these pearls to NY ~ as does the NYTimes! 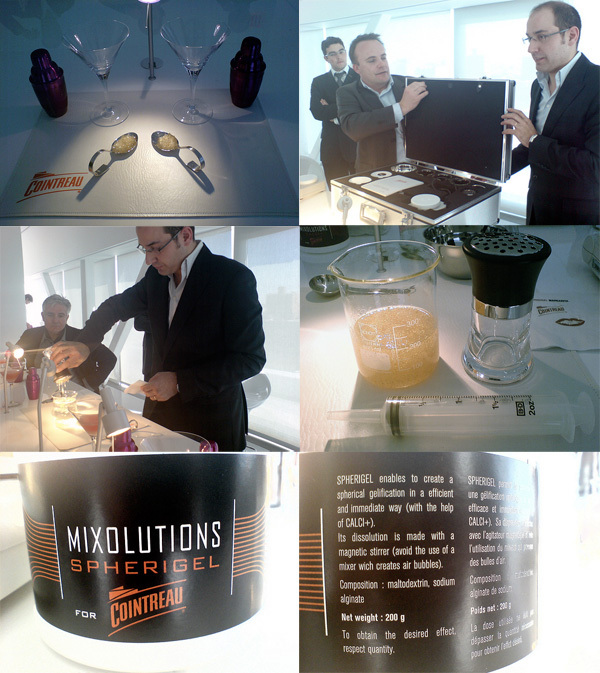 And perhaps one of the most exciting of all was finding this Photoset on Flickr by Donbert of Cointreau Spherification which actually shows the kit itself! Here is a video i found on youtube of the launch as well! Does anyone know where i can find this kit or a any kit for this process in the US? just for another quick couple of points. for one, yes please lets forget marcel from top chef, the guy could even use isomalt properly, so please forget him and stop glorifying a bunch of spotlight chefs would you! And whoever said that this is not like tapioca is very much mislead, it seems that you have only read about sodium alginate and not actually worked with it. It only keeps the caviar “pop” for at the very most and hour at room temperature. The second you plunge it into a cold liquid like a cocktail the hydrocolloid structure seizes like jello in the fridge. 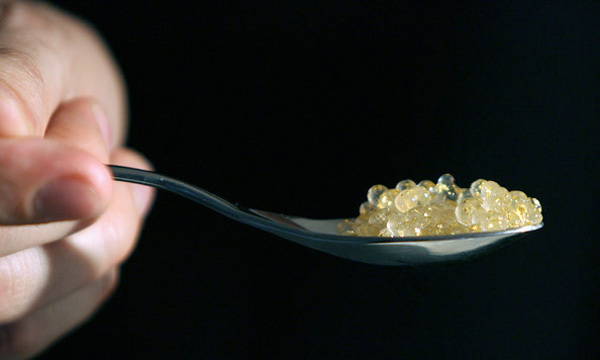 Alginate does not work as perfectly as you may believe it does so the end result when somebody consumes the balls is very much similar to that of tapioca, the difference is the same difference between newtonian and non-newtonian substances, and that is the initial bite from shear force. wow, way to make a fuss over something pastry chefs have been doing for over a decade. How much does that set up cost you, with the brief case and all, when all you need is a squeeze bottle a couple of bowls and about 5 dollars worth of sodium alginate and 1 dollar worth of calcium lactate. 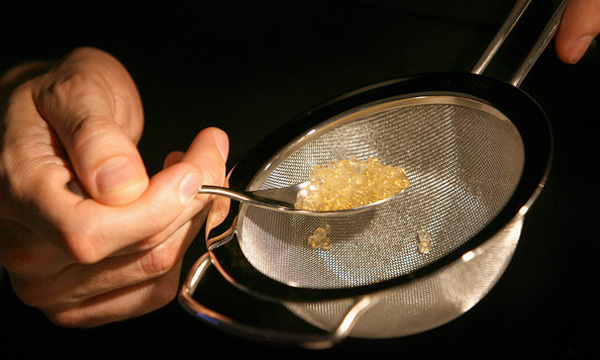 I guess we won’t see bartenders using agar agar or crystallized sugar for the same effect for five to ten more years, unless flairhouse has something to do with it. can someone can me this recipes or show me how to do it please? Where can I get a kit???? Can’t find even a similar product available. If you know of any would you be so kind as to let me know. How do place an order? i think wylie dufresne of wd-50 in new york does something similar with grape juice. and let’s not forget marcel on top chef with his coffee caviar. nevertheless, it’s still mesmerizing. how i’d love to try one. Molly ~ bubble tea is tapioca, and those are solid gelatiny feeling balls ~ the Spherification is more like creating a coating around the balls of liquid that can burst in your mouth! Like caviar! Hey, I’ve seen these before: they were called Bubbletea! Or maybe that was just the Wal-Mart knockoff.. This technique is a fairly well known in molecular gastronomy circles. Ferran Adria, chef and owner of El Bulli in Spain, is the mad genius behind many of these incarnations of food items in surprising forms and textures.